Looking to refinish or replace your countertops, but not sure which material to choose? With so many options available- Granite, quartz, marble, porcelain- the choice can be a bit overwhelming. They all have their pros, and they all have a few cons. 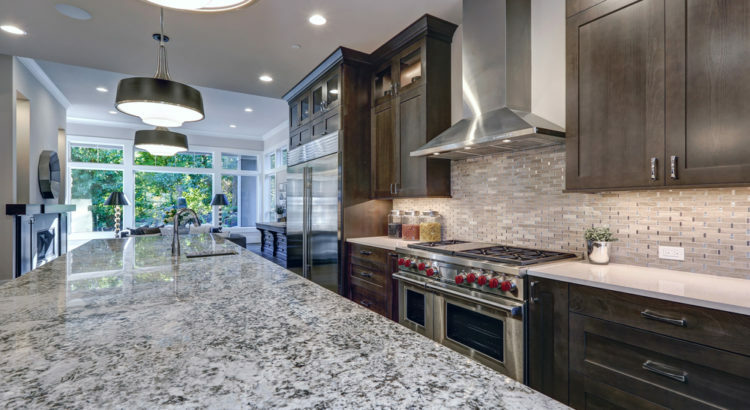 One of the most popular finishes used for countertops today is granite. Not only is it a visually pleasing choice, but it has several other benefits as well making it an optimal choice. Refinishing your countertops should enhance the overall look of your kitchen, rather than disturb the previously achieved aesthetic. Granite comes in more than 20 different shades, making it easy to find one that blends seamlessly with your cabinets, flooring, and walls. Using granite can quickly transition your counters into a focal point in your kitchen. Their timeless appeal and rich beauty are quick to steal the show in any space. When it comes to your countertops, you want a material that not only looks good but is also functional. Granite is a highly durable material. It can withstand the normal wear and tear of food preparation in your kitchen, without scratching or chipping the surface. In fact, it is so hard that knives will not damage the surface, but the surface may dully your knives. It is also resistant to stains, and won’t absorbs excess liquids giving you peace of mind while cooking or washing dishes. Granite also resists heat well. Being in such close proximity to your stove, this is a key factor. When you absent-mindedly set down a hot pan on your counter, the granite can take the heat without being damaged or weakened. Because of their durability, the lifespan of granite countertops can be decades before they need replacement. With proper maintenance and care, they may even outlive the house! To learn more about our granite countertops, and other refinishing services contact us today! Fill out our contact form or call us directly at (800) 463-1879!